But a hosted Exchange server is expensive ($250/year expensive), and Gmail has apparently improved, so it’s time to investigate a move. However, I’ve still got a major problem with Gmail – I really don’t like doing email in a browser at all, which is a bit of a problem given Gmail is built around the browser. So I went looking for a desktop client for Gmail. And found Postbox, which is like Thunderbird on steroids. 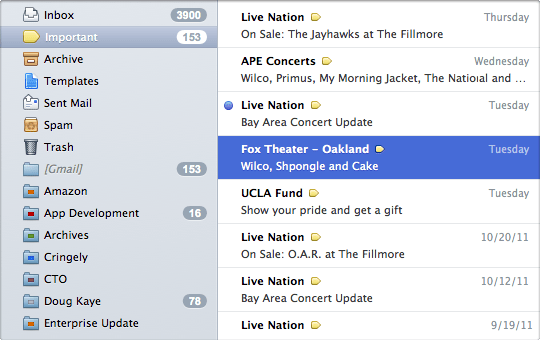 This is just a first look – I’m not using it fulltime as my only email client, but I am using it a lot. Yes, it’s doubling up my email handling, but I’ve got to test it. So I will probably change this over the next couple of days/weeks, especially if I hear back from Postbox re my queries below. First up, it’s insanely faster than Outlook with Gmail, so that’s a great start. It looks quite similar, which is a plus for those who are making the switch, but works with Gmail vastly better. It works beautifully with Gmail labels, as well, as can be seen in the above image, including the new “important” label, which seems to be how the “priority inbox” system works. Did I mention that it’s fast? Oh yeah. Unless you delete hundreds of emails in one hit, which is fair enough for an IMAP client, as it’s talking over the net to the Gmail server. That makes sense. This might seem like a small thing, but I really like it – clicking on the new email desktop notification takes you to the application rather than popping the email up in its own window. Much better workflow, IMHO, always having the same look. On the downside, however, it will happily show you messages in the notification window that you’ve already deleted, which is bizarre. Conversation view works pretty well. I like that I can tell it “only last ‘n’ replies when replying to an email. It’s social media aware, bringing in photos for people from several social media networks. So overall, I really like it. But it has quite a lot of issues/niggles. When deleting files, the focus moves to the message ABOVE the deleted one (i.e. a NEWER message), which is just weird behaviour. In Outlook, if you delete, for example, the third message from the top, the focus stays on the third message, which has moved up from fourth. In Postbox, the focus moves up to second, which is seriously annoying when you’re trying to move quickly through a list and read/delete and it keeps moving back to a message you don’t want to deal with right then. Sorted, see comments. When you click on a label (really an IMAP folder) it defaults to no message rather than the top one, so you have to then click on a message to see any content. You can’t tell it to show images in email by default, so you have to tell it to show the images every time you get email from a new source. (It’s a persistent setting, which is good, but it’s a PITA to do it EVERY SINGLE TIME you get email from someone new.) Sorted, see comments. Clicking on a link to follow it in your web browser doesn’t change the colour of the link to the clicked colour. So you can’t tell if it’s been successful or not. Also really annoying – if you and another person are sent an email by a third person, “reply all” doesn’t just reply to the other two, it puts your email address in there as well. Bizarre. (I tested Gmail, it doesn’t do this, it behaves normally and just sends to the others.) Doesn’t seem to be doing this now? weird. The spell check appears to check the underlying HTML code? Really weird. Also, REALLY ANNOYING to have it choke on code that it doesn’t have in the dictionary. It has Evernote integration – but only for the Mac! Incredibly frustrating. This isn’t a problem or a bug, but I much prefer the Outlook way of separating the inbox into headings for today, yesterday, last week, etc, whereas Postbox just gives you a long list of emails. If you get multiple emails that you would expect to be grouped as a conversation – i.e. all with the subject “Reply to thread ‘UWA paralysis’ ” – which Outlook happily puts together, this doesn’t happen with Postbox, it happily leaves them all as a long string of single emails. It appears there’s no solution available or coming, which is incredibly annoying. Support: We use different mechanisms to link messages together. If Flickr is sending messages with different reference header IDs, then we will treat them as unique messages. We’re pretty strict about this due to the way that we thread conversations and apply topics. It has a ‘tags’ function, which can colour your messages based on assignable criteria (like Gmail’s ‘labels’ or Outlook’s ‘rules’) but you can’t tie these to the Gmail labels! Incredibly frustrating, because it’s a great feature. I’d have emailed/posted in their support forum about these things, but they don’t appear to have anything bar twitter as a way of communicating with them. OK, you do it by filing a bug report, even when it’s not a bug. I filed one, then I have kept asking unrelated questions on the back of that. But they don’t like that, so you have to file a bug report every time. Apart form being very annoying, it seems like a bizarre way to run support. Previous So how much are you supposedly saving, Living Social? Interesting. I used to have a strong aversion to the idea of mail-in-a-browser in the days before gmail existed. I used Mutt for years and was quite happy with it, but wanted to move my mail to something hosted. I went from Mutt to gmail (talk about a culture shock!) and to be honest it’s never bothered me at all. I never thought I would, but here I am. 🙂 Gmail’s browser interface is just so damned good, and so damned fast. I found your comment about focus when deleting emails interesting, as my Outlook (work, Exchange) has always worked the opposite way to what you’re used to, and it’s never bothered me at all. I also forget to look at email when it’s browser-based, although now I look at FB so much that may not be so much of an issue, maybe I’d remember. * Just log a bug on our support portal if you get stuck on anything. Thanks for that Sherman. I’m liking it, and am about to move over to GMail fulltime as a result. is there a GOOD way to ask questions? If they’re not bugs, the bug-reporting process is a PITA (five screens…), and doesn’t actually give much hope of getting a reply if the final screen is anything to go by.